In February 2016, the Consortium commissioned a workgroup to develop standards of practice and core competencies for the profession. The committee’s charge was: “to develop and disseminate standards that can be operationalized on any campus, whether or not these campuses have LGBT resource professionals. These standards will be a companion document to the Council for the Advancement of the Standards in Higher Education’s (CAS) LGBT Program and Services Standards.” The workgroup—comprised of Debbie Bazarsky, Brian Edwards, Luke Jensen, Sivagami Subbaraman, Bonnie Sugiyama, and Shaun Travers—met from 2016 to 2018 to develop these standards of practice in the context of the evolving and changing landscape within higher education. In the development of the core competencies, the committee centered: 1) the constituencies served (i.e., students, staff, faculty, alums, and the local community); 2) the identities of the LGBTQIA+ community (i.e., lesbian, gay, bisexual, pansexual, same-gender loving, transgender, nonbinary, agender, genderqueer, genderfluid, Two Spirit, bigender, pangender, gender nonconforming, gender variant, intersex, asexual, aromantic, and emerging identities, as well as intersecting identities, such as race, ethnicity, nationality, immigration status, gender, class, disability, religion and spirituality); and 3) the wide and complex variations in institutional structures, divisions, and departments within higher education. The twelve core competencies are designed to provide direction for the profession and are built upon the work of LGBTQIA+ directors and professionals who have come before us. Through these standards, we strive to inspire professionals currently in the work; guide emerging professionals to consider this path in higher education; provide guidance to institutions who are planning to create a position and a Center; and support administrators who supervise LGBTQIA+ directors and professionals. We view these core competencies as an opportunity to think robustly about our roles in higher education; and we recognize some competencies will have more resonance than others given the broad diversity of our roles and institutions. The intention of the standards of practice and core competencies is to provide opportunities for LGBTQIA+ directors, professionals, and administrators to: 1) further advocate for support and resources needed to adequately do this work within institutions; 2) continue to deeply assess one’s own learning edges for personal and professional development; 3) enhance the mentorship and fostering of early career and aspiring professionals; and 4) make visible the profession in higher education literature. Additionally, these competencies provide an opportunity to expand professional training and education for our field and offer guidance for the profession. Over the next 12-18 months, there will be many opportunities to engage with the competencies. There is a much larger article about the standards of the profession and core competencies that will be forthcoming. There will be presentations about the Core Competencies via Consortium webinars, at the 2019 NASPA Annual Conference and Creating Change 2020, and other national conferences. Moreover, a compendium about how to use the competencies is also forthcoming. Our hope is this is the beginning of a much larger conversation about the profession, our collective vision for the work, our transformative work as LGBTQIA+ directors and professionals, and the future for LGBTQIA+ campus life. Has the ability to envision and execute a strategic direction for all facets of LGBTQIA+ campus life. A critical role is thinking and acting strategically on behalf of all LGBTQIA+ constituencies (i.e., undergraduate students, graduate students, staff, faculty, alums, parents/families, and community members) who have varied, and sometimes competing, needs. The LGBTQIA+ director/professional is innovative, has strong political acumen, thinks and acts strategically, and builds meaningful partnerships with colleagues across academic and administrative departments. From the development of a strategic plan for LGBTQIA+ campus life through consulting with senior leaders about an array of LGBTQIA+ and other diversity and inclusion topics, the director/professional needs to be able to customize messaging about the work to various campus stakeholders (e.g., cabinet members, trustees, student leaders, institutional committees, and faculty senate) to achieve institutional support for all LGBTQIA+ constituencies. Navigates complex campus structures and contexts with political acumen to affect institutional change for LGBTQIA+ communities. Colleges and universities are complex organizations with multiple layers of administrative structure, each encompassing their own mission, values, culture, and institutional priorities. The LGBTQIA+ director/professional interacts with each of these layers within their specific context, in order to affect and sustain institutional change towards a positive campus climate for LGBTQIA+ students, staff, faculty, alums, and other campus stakeholders. This navigation requires a political acumen in negotiation, communication, and managing power dynamics. Provides administrative leadership and management of human, physical, and financial resources dedicated to supporting LGBTQIA+ campus populations. Whether located within a standalone unit (e.g., LGBTQIA+ center) or as part of a broader entity (e.g., diversity and inclusion), the LGBTQIA+ director/professional actualizes the mission and provides vision and oversight for the leadership and management of financial resources, human resources (e.g., hiring, onboarding, supervising, and termination of staff), technology, facilities and equipment, programmatic initiatives, and overall assessment of programs, services, and issues of access and equity. They develop and maintain strong collaborative relationships with campus partners and community organizations to support stakeholders with varying needs. Additionally, they seek institutional and external support to expand financial resources. Creates a culture of belonging within the campus LGBTQIA+ community through inclusive practices that embrace all LGBTQIA+ identities and the diverse intersections of these identities. The LGBTQIA+ community is diverse in the many identities that exist within and outside of gender and sexuality spectra. As a microcosm of society, the LGBTQIA+ community is not immune to the historical and current injustices within and outside of the LGBTQIA+ community, particularly around race and ethnicity, and including but not limited to issues related to nationality, immigration status, gender, class, disability, religion and spirituality. New and emerging identities are a constant in the field and the LGBTQIA+ director/professional creates spaces for the entire campus, alums, and the local community to learn about and embrace the developing landscape for inclusion. Additionally, there are identities within the LGBTQIA+ community that experience marginalization from within the LGBTQIA+ community. 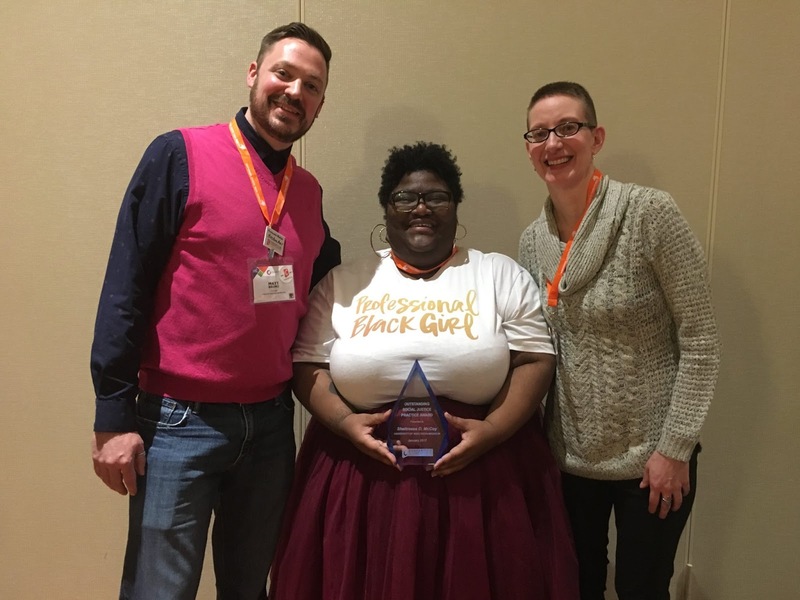 The LGBTQIA+ director/professional must intentionally create spaces where the intersections of all LGBTQIA+ identities are respected, honored, and celebrated. Has significant knowledge of and experience with policy and practice related to LGBTQIA+ communities in the broader context of equity, diversity, and inclusion. Equity, diversity, and inclusion issues are present throughout all campus structures. The ability to incorporate intersections of sexual and romantic orientation and gender identity and expression into ongoing diversity and inclusion conversations, practices, and policies requires both deep knowledge and significant interpersonal skills. The LGBTQIA+ director/professional must remain up-to-date and have knowledge about: 1) federal, state, and local laws that affect LGBTQIA+ people (i.e., both in terms of their LGBTQIA+ and intersecting identities) with a special emphasis on continuously changing laws and ordinances, emerging legislation, and Title IX guidance; 2) related compliance reporting obligations; 3) harassment, bias, and violence intervention; and 4) national best practices and additional proactive measures regarding anti-harassment training and violence prevention. Because LGBTQIA+ issues have emerged more recently on many college and university campuses, the ability to have expertise in historical and existing equity, diversity, and inclusion issues (i.e., especially around race, ethnicity, nationality, immigration status, gender, class, disability, religion and spirituality) requires practical knowledge, experience, and proficiency. Assesses campus climate and LGBTQIA+ success using multiple measurement methods and communicates the impact of LGBTQIA+ communities on campus and the impact of campus on LGBTQIA+ communities. The LGBTQIA+ director/professional must be knowledgeable about LGBTQIA+ research design, methods, data interpretation, and privacy concerns, so they can effectively consult their campuses (e.g., institutional research offices and data analysts, senior administrators, individual departments, and faculty and other campus researchers) on data collection. Many campuses define institutional success through specific strategic goals (i.e., tied to closing achievement gaps related to retention, GPA, graduation rates, and time to degree); and measurements are often cisnormative and heteronormative and based on national and state instruments that typically have not considered LGBTQIA+ communities or their intersecting identities. Therefore, the LGBTQIA+ director/professional should have significant expertise to consult on inclusive instrument creation/enhancement, effectively measure campus success, clearly interpret data, and communicate findings in persuasive and meaningful ways, in order to enact change. Additionally, program assessments, the most common evaluation utilized in this work, must be in alignment with broader constructs of institutional success. Participates in the intellectual life of the institution and contributes to its academic mission. The LGBTQIA+ director/professional partners with faculty, staff, students, and administrators in the core mission of higher education—research, teaching, learning, and service. The LGBTQIA+ director/professional has the ability to collaborate with faculty across disciplines in curriculum transformation to: incorporate LGBTQIA+ issues into existing courses; develop curriculum for courses focused on, or inclusive of, LGBTQIA+ content; and support the implementation of LGBTQIA+ studies or other formal academic programs focused on gender and sexuality. They provide learning opportunities, which complement academic curricula (e.g., organizing lecture series and colloquia, curating art exhibits and performance series, facilitating academic book clubs, and providing other educational offerings) and provide extensive information for faculty and those seeking coursework related to LGBTQIA+ identities. Moreover, the LGBTQIA+ director/professional supports faculty, staff, and students who engage in research, facilitates workshops, and assists instructors with the provision of supportive learning environments through shared best practices (e.g., inclusive pedagogy and andragogy, pronoun use in the classroom, and names on rosters). Provides institutional partners with support and consultation, through an holistic approach, to enhance individual and community success. The LGBTQIA+ director/professional intentionally collaborates with campus partners (e.g., admission and enrollment services, centers for teaching and learning, human resources, academic affairs, student affairs, health and counseling centers, public safety, and athletics) and community organizations to holistically support (i.e., in mind, body, and spirit) LGBTQIA+ people and all of their intersecting identities. They consult with colleagues on the development of training, curricula, resource materials, and outreach strategies with the goal of building capacity among a network of institutional partners who share the responsibility in developing an intersectional lens for cultural competence that includes programs, services, advocacy, and resources. Collaborates with institutional partners to increase access, recruitment, and retention of LGBTQIA+ students, staff, and faculty. The LGBTQIA+ director/professional utilizes institutional knowledge to advocate for increased access, recruitment, and retention. Drawing upon a variety of institutional tools and data sources (e.g., campus climate surveys, national health and engagement surveys, human resources exit interviews, and focus groups), they assess the state of the LGBTQIA+ community at the institution. The LGBTQIA+ director/professional interprets data to discern issues that may positively or negatively impact individual and community access, outreach, conditions of success, and barriers to achievement. They understand what makes success possible at their institution and collaborate with campus partners (e.g., admission, human resources, faculty senate, student affairs, academic affairs, alumni affairs, athletics, identity-based centers, and institutional diversity, inclusion, and equity offices) to improve recruitment and retention of LGBTQIA+ students, staff, and faculty. Supports the LGBTQIA+ community through strong crisis management skills and collaboration with key campus partners. LGBTQIA+ people are often reluctant to access counseling centers, employee assistance programs, and other campus resources. They frequently first seek support from the LGBTQIA+ director/professional for: 1) mental health (e.g., depression, self injury, and suicidal ideation); 2) sexual harassment and assault (e.g., sexual and physical violence and intimate partner violence); and 3) bias-related incidents (e.g., overt discrimination, hate crimes, and implicit bias). The LGBTQIA+ director/professional must be proactive, execute excellent judgment, and have established collaborative relationships with colleagues across campus to effectively respond to situations. This includes serving on and/or engaging with crisis response, bias response, threat management, and case management teams. The LGBTQIA+ director/professional ministers to the campus community and provides support, guidance, and programming around national and local events that deeply affect them (e.g., legislation and supreme court rulings, sexual harassment and assault cases, hate crimes, suicides, and responses to national violence, such as the Pulse shooting and police brutality). In addition to crises, all constituents seek out support for interpersonal issues (e.g., adjustment to campus, relationships and family, academic distress, and workplace and campus climate concerns) and identity-based topics (e.g., sexual orientation, gender identity, other intersecting identities, transitioning, and coming out). These require a comfort with providing support, guidance, and referral services as appropriate. Engages LGBTQIA+ and allied alums and supports institutional goals around fundraising and advancement. The LGBTQIA+ director/professional brings alums back to campus (i.e., sometimes for the first time) and provides opportunities for active engagement and participation. Alumni affairs and development colleagues rely on the LGBTQIA+ director/professional to help identify and recruit LGBTQIA+ and allied alums and family members, organize events, collaborate across affinity groups (e.g., Black, Latinx, Native American, and Asian and Pacific Islander alum groups) to co-develop programmatic and other opportunities for networking, engagement, and giving. The LGBTQIA+ director/professional engages alums, families, and community members in fundraising for both LGBTQIA+ services and overall giving to the institution. They also support alumni affairs and development officers in a multitude of ways, including: training around best practices, record keeping, and collaboration with other colleagues who serve these constituencies (e.g., career services, financial aid, parent and family programs, academic programs, and student affairs). Utilizes knowledge of research, theory, and history of LGBTQIA+ communities, grounded in social justice, equity, and inclusion. The LGBTQIA+ director/professional is designated as the campus expert on LGBTQIA+ communities. Distinct from faculty, researchers, and other educators who create and transmit knowledge in specific areas and domains, the LGBTQIA+ director/professional relies on integrated community knowledge and history, coupled with significant and emerging research, to provide immediate practical advice and direction regarding issues of policy and practice and informed action. Theory (e.g., social justice theories; identity development and student development theories; and critical race, feminist, queer, economic justice, and crip theories), as well as the legacies of community activism and current civil rights and social movements, informs the inclusive and intersectional practice of the LGBTQIA+ director/professional and the profession. If you would like to provide feedback to this working group on ideas and concepts within the Standards of Practice document, please contact Shaun Travers at [email protected]. Tyler Clementi Center Academic Colloquium- Attend In-Person or Via Livestream (Free)!